 Home › Metro news › AGAIN? Young Houseboy Butchers His Female Boss To Death In Edo. AGAIN? Young Houseboy Butchers His Female Boss To Death In Edo. 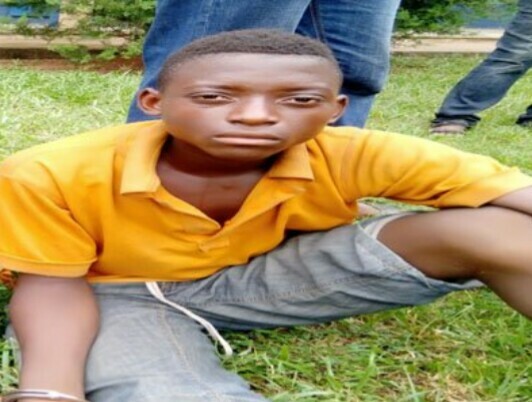 A 16-year old houseboy, Zakaria Chiahemba, has been nabbed by the police in Edo state over an alleged murdered of his female bossand taking her belongings. He purportedly murdered his boss, Rejoice Odogwu, 51, with a hatchet, cutlass and stick. The episode happened on October 3 at 25, Osazuwa Street, Oluku in Ovia North East region of the state. Zakaria allegedly escaped with the deceased’s money, phone and jewelry after committing the murder. He was arrested at Wukari in Taraba State on November 23. Speaking to reporters when he was paraded, Zakaria denied killing his boss. He said his brother brought him from the village for the deceased, to help enrol him in school. Zakaria claimed that the deceased was killed by some of her customers, who were angry that their phones were stolen at her shop. Police Commissioner Babatunde Kokumo said the suspect would be arraigned after investigation.